14th century stone statue of the Black Madonna left of the altar. A beautiful painting of Saint Catherine. The imposing looking west portal. The stone Black Tower east of the church, which used to be part of the 12 century city walls. Check the church website for service times. Subway Line 1 and 5 stop Sainte-Catherine. Buses 86, 126, 127, 128, N16 stop Dansaert. People normally also visit Grand Place while planning their trip to Sint-katelijnekerk. Very nice church. Attended the new years eve mass and they had really prepared well for the celebration. Perfect stop if you are going around the city centre. Excellent site for gothic style enthusiasts, the building is beautiful yet not very high as gothic style is used to; nevertheless it is nice beholding the flying buttresses and its beautiful rossettes; the whole church is very interesting and wonderful. 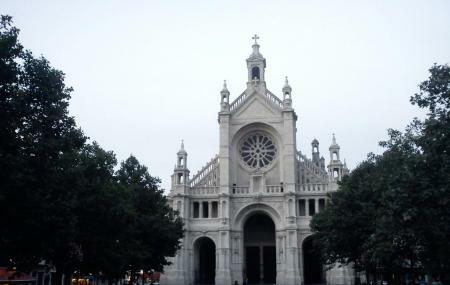 A very nice church and historic building in the heart of Brussels. One great monument full of history in Brussels, Belgium. Visit any time of the year and it is usually open for free to public, around you have the saint catherine place with a lot of cafes and restaurants. Beautiful in the xmas season surrounded by xmas markets.